On April 17, 2014, Chan Tei DuRant was worried. The education aide for councilmember Marion Barry had been too busy to make the council hearing that day on DCPS renovations. But she desperately wanted to know if parents from Orr Elementary, in Ward 8, had showed up to testify about the sad state of their school’s facility. When she discovered the Orr parents were absent, DuRant just shook her head sadly. Without those parents testifying, she knew Orr would not get a fair shake at the dollars available for school modernizations. Welcome to the world of DC school parent engagement, political style. Orr is but one of many DC public schools with awful physical plants–some of which, like Orr right now, remain untouched by any significant work. While there is a clear parent “engagement gap” throughout DC public schools, the parent political engagement gap is downright perilous. And I as a parent have seen it up close. In the last two years, I have been privileged to attend many hearings at our city council, to testify on behalf of my DCPS school. Those hearings are held during the day. I have seen parents from other DCPS schools testify—often (like me) white, often professionals for whom time off from their paying jobs is not a hardship. I have also seen DC charter school administrators, students, teachers, parents, and even professional lobbyists for DC charters testify. But what I have not often seen inside our city hall in almost any capacity are the actual school stakeholders from the poorest areas of the city or in the schools with some of the worst conditions and/or poorest students. As DuRant’s disappointment indicated, this political engagement gap has ramifications. That same spring, I testified to the council about my school’s longstanding physical plant issues and the city’s professed lack of money to address those woes. I noted that, by contrast, our city had recently given $200 million for an 1100-room Marriott hotel downtown. That amounted to $180,000 per room. Yet, my frequent presence in our city hall notwithstanding, I have no illusions about my power in relation to Marriott. Or to the Washington Wizards, for which our city will be paying tens of millions for a new training facility. Or to the Nationals, for whose stadium DC expenditures have left the city with a debt of half a billion dollars. Or to DC United, for whose new stadium DC will spend about $150 million. For all my (unpaid) time spent preparing for, and sitting in, and writing about, hearings related to DC public schools, I have never even garnered for any school the relatively paltry $32 million that LivingSocial was able to wrest from DC in 2012 for tax breaks! And I have no illusions about my power as a citizen and parent relative to that of FOCUS, a nonprofit funded in part by the Walton Family Foundation whose staff lobby local elected officials on behalf of charter schools in DC. In fact, FOCUS the other week tweeted out its recent legislative accomplishments on behalf of DC charter schools. Me? Other (unpaid) parent lobbyists? Well, I can send a fast email–in fact, I have sent lots of emails as a parent on behalf of my schools. So have plenty of my fellow parents, whether for supporting our school budget or demanding better facilities. Ditto for phone calls. Petitions. 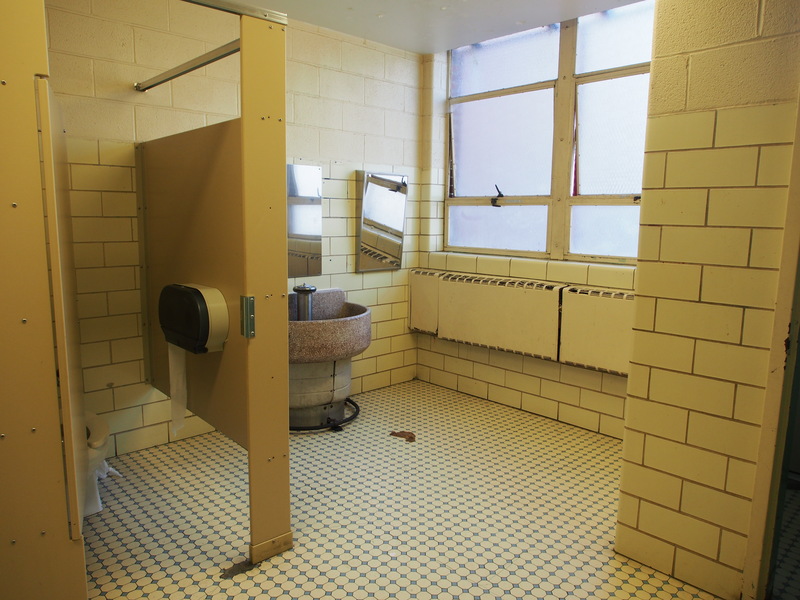 Indeed, earlier this year, parents invited David Grosso, the chair of the council’s education committee, to tour Watkins Elementary (that of the ugly bathroom pictured above) to see its condition firsthand. This year, Watkins was awarded nearly $40 million for a renovation, which will take place in large part in the next two summers. Because if what it takes for the city to do right by our kids is (unpaid) parents showing up at our city hall–or paid political advocates showing up or the right political official contacted or some combination thereof–then something is quite wrong. Take a ruler and align it with the mortar of the bricks to the right of, and above, the top window. It will not line up with the rest of the bricks or the windows themselves. That is because those facade bricks are slowly moving downward. 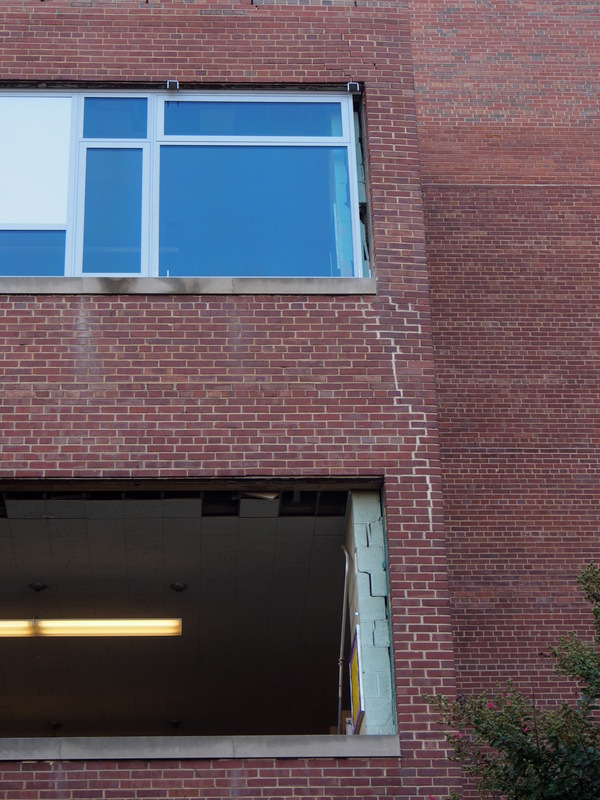 DCPS and DGS attributed the cracked interior walls pictured here to damage from the 2011 earthquake. Seven years later, the bricks there–and at countless other DC schools just like Watkins–are still failing. Who is tweeting about that? And who is helping those other schools?